Every cyclist needs a helmet, and to be honest, everybody needs to do a bit of cycling. Whether it be for commuting, or just a bit of health ride. Cycling provides an easy and effortless (normally) way to enjoy the good old outdoors, with little costs involved. Of course, for me, and many other people living in Oxford, cycling is pretty much the most efficient way of getting around. Often quicker than driving, and definitely quicker than taking a bus, cycling lets you get from A to B in Oxford better than any other way. The same applies to many other cities, though I can only speculate. Cycling helmets are an intrinsic part of your safety as a cyclist, and should definitely not be looked at as an option. They come in various shapes and sizes, and they all provide you with their own pros and cons, and some styles work better than others when it comes choice or needs. The Urban range from Lazer is specifically designed for the adventurous type. The range includes various shapes, all of which have been designed for the urban adventurer. They encourage you to be safe, whether you are cycling, or indulging in other street sports, such as skate boarding. The Street Deluxe, is part of that range, and is designed to give your head a full coverage. The Street Deluxe is designed to give your head coverage on all sides. It is a bit heavier than your usual helmet, but because it hugs and covers all of your head, it spreads the weight and does not feel heavy on your head, even if it does so on your hands. Available in two flavours, wood and urban, we went for the wood, and many people have actually asked me if it is real wood, and have come and had a feel. It definitely looks the part, though it obviously is a fake wood affect rather than the real thing. If it helps, real wood will not give you the same life nor protection. I have not tried to fall or bang my head wearing this, but this helmet is a lot thicker than your normal helmet, and it hugs your head pretty well, all the way from the back of your head, near your neck, to your front. It definitely gives you a feeling that your head is better protected that normal helmets. Does it keep my head warm? Not any more than normal helmets. Your ears are still exposed, so a hat or a balaclava will still be needed if you are used to that. I have a big head. I almost always need the biggest helmet size available, and with this, I needed a large too. Even on that, I had to loosen it to maximum, but tightened the straps. It fits pretty well though, so I am definitely not complaining. The strap is made of leather (or leather effect) and is very comfortable around your neck. It latches itself thanks to a clever magnetic system, which just clasps when you bring it together. To open it, you have to slide it in a specific way. Takes a little getting used to (if you have to fiddle around with it in the dark), but it is way better than any other setup I have used yet. 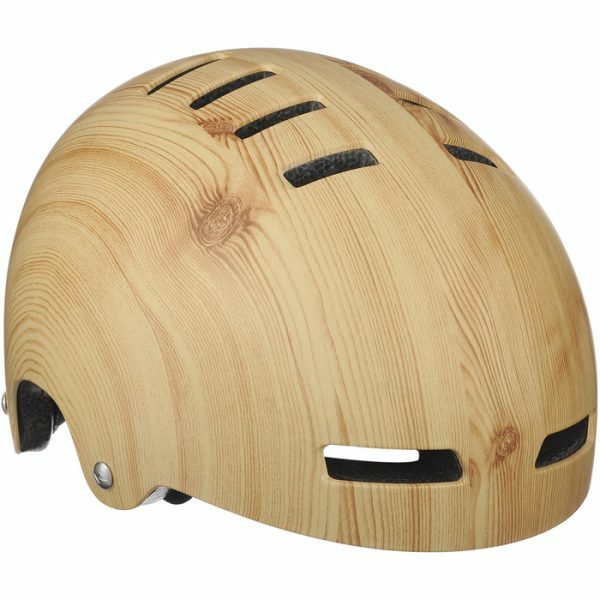 When you commute and ride around a city, you want just a bit more from your helmet. For example, I like to lock my helmet to my bike so I don’t have to carry it with me. This means that I want the helmet to have big enough venting holes in it so that the lock can go through. This one lacks that, and while vents exist, they are small and thin (and frankly, look good), and would not allow my D Lock to go through. You can pass your lock through the straps, but it just doesn’t feel as safe. The second thing I am quite keen on is being able to have some lights on my helmet. For this too, I use the vents to hook on some extra lights. While the vents are definitely big enough to allow light straps to go through, the helmet itself is so thick that they wouldn’t reach, so I couldn’t attach my bike lights to it. It retails for £44.99, and can be bought directly through the website. A great and good looking helmet that focuses on protection over other things. Great for long bike rides as well as any street action, but probably not the best for commuting. Previous story Mondo – Beta Test the bank of the Future!